← Got networking equipment you aren’t using? 10 Responses to Could Apple Read iMessages? Just a quick follow-up to mention that there are (or seem to be – I obviously haven’t tried them myself) apps in the iOS store that do let you do secure public key encryption. oPenGP is one that looks good. I don’t know if there are any that have integrated IM (as opposed to mail) functionality, but if not you could copy/paste the encrypted text into other messaging apps. If you are looking for something like this, the important feature to watch for (as it relates to the vulnerability described in this post) is that it gives you a way to put trusted public keys onto your device without having to get them through some external service hosted by a party that you don’t want to be able to intercept your messages. Update #2 – props to the author of the original article for adding an update to the post that clarifies / corrects the issue, stating that because of the issue described here (and there are other variations), the messages can actually be intercepted / read. I understand how MitM would work with iMessages, I clarified that after linking to a comment thread on HN. I didn’t think you needed to explain it anymore than you already had (but you did), since that wasn’t the issue I was bringing up. The article could just be trying to convey the technical details of how it works, and they did a great job of that. Based on that quote (and what’s said prior to it here) and your twitter comments it seems as though you want(ed?) to imply that the article was meant to explain how iMessage is completely secure even though it doesn’t, the title of the article should prevent you from concluding that. Even the docs that Apple released that this article is based on doesn’t imply it’s as more secure than another, including GPG (since you love to compare it to that). Again, the article is hardly a “joke”. I don’t mind that you have higher standards for Apple’s products, argue that they should be better all day; your compromises are is a personal choice. Users could transfer the keys in person, or via any other channel they trust that X doesn’t control. That’s what I mean by saying “it’s not really possible”. A company that cares about the user experience would never do this. I couldn’t imagine providing keys for each one of the devices that I want to message with, it’s completely impractical. Even your solution shows a major flaw, “via any other channel they trust that X doesn’t control” because you’re trusting someone, even the person you privately whisper the key to. If you think security is a boolean than it’s always false, even your highly touted GPG has had it’s problems. And now we’ve come full circle: the problem with the article (or at a lower level: iMessage) is not your distrust in Apple (even though you trust other “platforms”, e.g. GPG). After you reply I’ll follow up with more about how the MitM attack that could happen isn’t what you describe. Here’s that statement of them denying it’s possible, at least they’re saying that they do not provide that information (which I would believe unless someone can prove otherwise). Anyway, they’re sharing what requests they get (too) but they’re still implying they can’t share iMessage or FaceTime data. even though we agree it’s technically possible, maybe not feasible. This is a little weird since we have had an in person conversation covering all this, but for the benefit of other readers, I’ll briefly address the points mentioned in both comments, while mostly trying to keep it related to what I said the scope of this post was – the technical question of whether it was possible. (emphasis on the word “can’t” is from original article). In the excerpted part of this quote they link to a story about the NSA possibly undermining the cryptographic algorithms themselves, but that “insane amount of effort” is not what we’re talking about here. Based on that, it does still seem to me that the article was in some ways trying to support the idea that interception couldn’t be done (as easily as described here), and that’s what the “joke” thing was about. But I definitely don’t want to argue about perceived motivations behind the post. Like I said, I was glad to see they updated it to clarify that the answer to this technical question is “yes”. As for allowing secure key exchange outside of Apple’s control in order to make it more secure, I certainly was never suggesting that should be only method, or even the default. Ideally, they could make it work exactly the way it does now, and simply add an option for the people who cared about it to choose to handle some key exchanges securely through another channel. The reality (which we both agreed to in conversation) is that they probably wouldn’t do that since that kind of security isn’t a priority for them in iMessage, and the users who care about it would probably already just use a different application / system that does support secure key exchange. We also talked about how there’s an even simpler method than I describe in this post since they say that they support new devices by sending the new keys whenever a new device is added. So they could easily add their own hidden “new device” to the mix, or replace keys for an existing device (just like would happen if the user bought a new iPhone to replace their old one), and the new keys would get added / replaced transparently to the users. I did intentionally leave out the additional device angle from the original post because I wanted to keep it as simple as possible, but ultimately the technique described in my original post is certainly still viable, and there are also lots of other even easier ways it could be pulled off given what we know about how new devices are handled. I appreciate the links and docs, but despite all of those I think we both know that it’s technically possible, and that’s the only point this post was making. I’d disagree that it isn’t “feasible”; some of the options that simulate extra devices being added would be pretty trivial for them to do. If the NSA told them they had to, they’d basically have no choice, so debating their their motivations or desires is irrelevant in my opinion. I’ve certainly never suggested that they want to do it, or implied anything else about that. That’s why I wanted to keep this post strictly about whether they *could* technically do it (if forced), and it’s clear that we both agree that they could. I wonder if the people that care about this, which probably know they’re being tracked, have tested if any of those attacks are being done, since it would be easy for them to do. 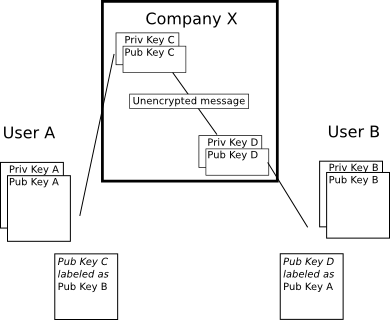 Option 1 – Replacing keys and swapping them around (your graph): User A could just ask User B what public key they have and vice versa. If different than it’s immediately clear a circumvention is being done. Option 1 – adding an extra device in the key bag that the user receives: User A just asks User B how many devices they have and if the totals don’t match than they can simply audit the keys (similar to option 1 but counting the keys would be easier). Subsequently these nefarious/crazy users need to check to see if the keys change, in amount and/or string, if a change has been made than they can ask the other user if they have a new device. So…with that in mind it really isn’t possible for the NSA to go undetected “unless there’s a backdoor” of some sort. This could be Apple’s out, stating it could easily be detected; we just don’t know if the NSA cares about the possibly of being found out, especially if they can somehow use Apple as the scapegoat. Only if Apple provided and easier method to check the keys reliably than you wouldn’t your method to exchange the keys in person. In Option 1, how do they “check” which key they have? Does Apple even make the keys visible in iMessage? As for the number of devices, same question: can you see in iMessage how many devices the other user has? Can you post some screenshots somewhere about what iMessage shows you in terms of other users’ key info and device counts? Like you said, they could always just not show that extra information in these cases, but I would be interested to see what it looks like now. I don’t know how to get them. I’m just saying they could check if they wanted. Option #2: you simply ask the other person how many devices they have. Then you cross check. I’m sure some smart person can (or has) figured something out. I’d guess calculating packet sizes would work with enough testing. You’re saying they “could check if they wanted”, but I don’t see any way they could. I looked all through Emma’s phone (iOS 7) which has many iMessage conversations with other iOS users, and I didn’t see any way to see anything about the keys and/or number of devices from another party you’re messaging, so I think that’s a no-go. If I missed it (certainly possible), please point it out to me via a screenshot / link. I don’t think asking and/or knowing how many devices the other person has would help in any way, because (again – same point as above) I don’t think it shows that to you on your device, so I’m not sure what you’d be checking that number against. Again, if it does show you, let me know where / how. 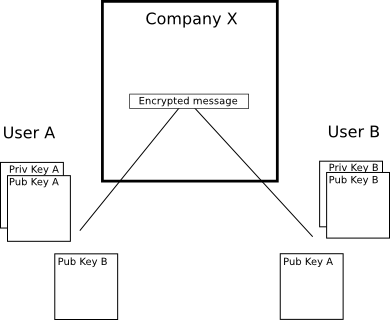 Lots of smart people have in fact looked at this, and I think most of them (who understand the technical details of how public key encryption works, and the iMessage platform as described by that post) have acknowledged that the answer to the question of whether Apple could (most likely on behalf of another party) intercept iMessage traffic – without either user being aware of it – is “yes”. I’ve never seen any convincing technical post refuting the “vulnerabilities” described here in a way that would make the answer to the question “no”, or even that would make the process detectable by the users. Again, if you know of any, please post a link. I’m considering this case closed, unless you’d like to post screenshots or an explanation of exactly (technically) how the users would do the kind of cross-checking you suggest.